SOUTHERN U.S. - A million dollar collection of seven ultra rare Ty Cobb baseball cards were discovered in a torn paper bag, thought to be trash, by a family going through the possessions of their great-grandparents home. The find has astonished sports memorabilia experts worldwide. The discovery of the cards is an amazing story. An article posted on the PSA website describes the moment of discovery. "The cards discovered in 2016 were unearthed in a rural town after a southern family was combing through the possessions of their great grandparents. The cards were found inside a torn paper bag on the floor. Initially, the family thought the bag was merely filled with trash and planned to discard it. One of the family members decided to sift through the contents, which included a number of postcards and other paper products. Beneath this small pile of items were the Cobb cards lying face down at the bottom of the bag." So far, the identity of the family (and location of the discovery) remains unknown. Because they wish to remain anonymous. According to an article in the Washington Post, the cards are extremely rare. Prior to this find only 15 were known to exist. This discovery now raises that total to 22. Anytime you have an in-demand collectible in scarce supply, made of paper, and over one hundred years old. It's extremely rare for that item to survive, let alone be in good condition. 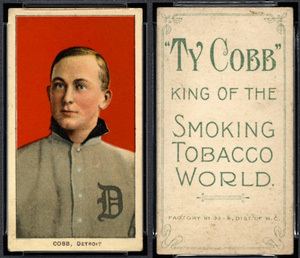 Video: NBC Today reporting on the rare Ty Cobb baseball cards found in an old paper bag. Want to quote us? If you're willing to credit the article to WhatSellsBest.com, and install a live-link to the original article, or www.WhatSellsBest.com, you can feel free to quote up to 100 words. While all other uses are prohibited without prior written permission (from whatsellsbest.com), we are friendly, and often willing accommodate mutually beneficial ideas and collaborations. Feel free to contact us with any questions and/or comments. More info about WhatSellsBest.com is posted below. *Price is based on foreign (currency) exchange rate at time of sale. WhatSellsBest.com is a free website which monitors millions of auction items, to track the top selling (highest bid) items on eBay, and report top sold items from a variety of specialty auction houses worldwide. Founded in late 2008, by James Massey, the site has quickly became a valued resource for collectors and treasure hunters interested in knowing which rare antiques and vintage collectibles were selling best at auction. Journalist and reporters from a wide-variety of media outlets, (CBS, AOL News, Inside Source, eBay Radio, Smart Money, and others) have also found WhatSellsBest.com to to be an informative and helpful website. TREASURE NEWS > Amazing monthly finds by everyday-people. FREE APPRAISALS > By the world's top experts in your item. SELLING-PRICES > How much buyers will-pay for most anything. MOST-WANTED > Unique items worth real-money. FREE UPDATES > Get our latest guides and news... Learn more. Have a news tip or story idea? Let us know. © 2019 WhatSellsBest.com. All Rights Reserved. See terms under which this service is provided to you.